Achieves fastest ashing time by combining effect of microwave and in-situ air flow. Has largest floor area to accommodate large quantity of sample to handles large quantities of polymers, oils, food, pulp, sludge, etc. Reduction in ashing times by up to 90% compared to resistively heated muffle furnaces. Substantial cost savings in sample analysis expenditure. Saves prime lab space with small foot print. Processing of 9 crucibles of 50 ml capacity at once. 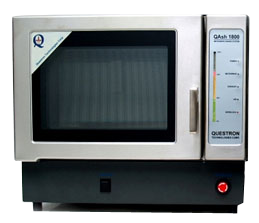 Attains 1000°C in 25 minutes with robust 1800 watts of microwave energy. Temperature homogeneity through 1000 C to 12000 C.
Possibility to carry essential operations with UPS in case of power failure. 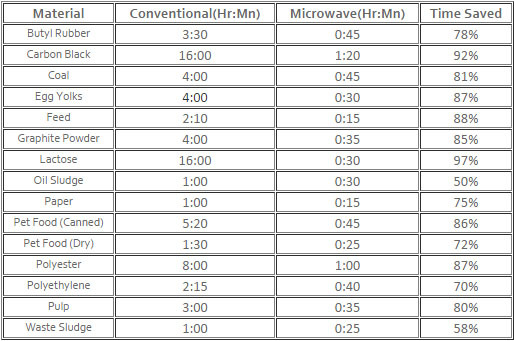 Microwaves are know to couple with SiC to produce high temperatures at much faster rate compare to old electrical heating furnaces. QASH has controlled air inlet introducing air right in ashing chamber fuelling ashing process. Introduction of air at source also helps push ashing by products out. Specially designed single form Alumina Fibre ashing chamber helps retaining heat further enhancing efficiency of ashing process. Vertically placed SiC plates in conjunction with super insulating ceramic material develop uniform temperatures across ashing chamber. 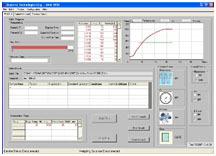 R type thermocouple encapsulated in chemical resistant material measures temperatures accurately over working range of 25 to 1200 C. Programmed heating and use of controlled air flow produces fast and consistent ashing results under such conditions. Compressed air or Nitrogen gas introduced in to the chamber draws out fumes and soot. With built-in fan and external blower QAsh 1800 directs hot gaseous component to safe disposal resulting in cleaner system interior and cooler exterior. This helps in maintaining comfortable working condition. Exhaust port on system has Filter Trap to stop particulate matter and other by products of ashing from escaping to exhaust fan resulting in increase life of exhaust fan.